Rob Bibow, a fourth generation Columbia grad, is helping fellow alums invest in an asset class that has long been inaccessible to even the most sophisticated investors. Rob Bibow (CBS ’96), Managing Partner at Fission Ventures, is a fourth generation graduate of Columbia University. His family’s story there dates back to the 1890s, when his great-grandfather graduated from its law school. It continues now as Bibow invests in promising companies with connections to the storied Upper Manhattan institution. 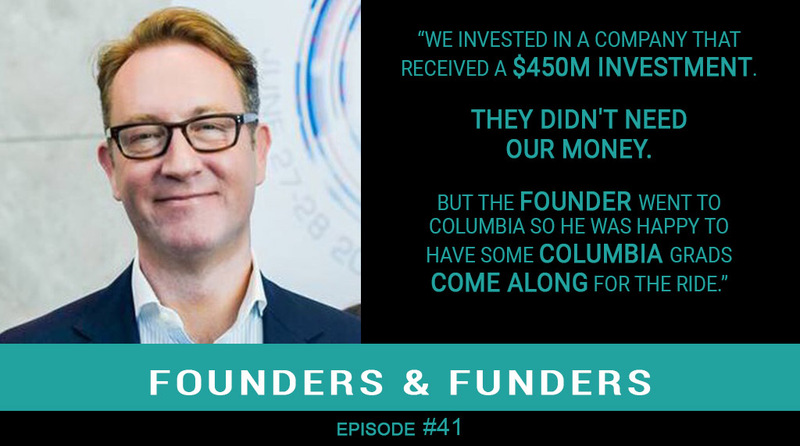 Bibow appeared on Founders & Funders to discuss why, after more than 30 years of finance experience, he’s excited to helm this particular fund that makes venture capital accessible to his fellow grads. “The venture capital sector over the last quarter century has been, by far, the best performer of any asset class … Venture has returned ~30% annually over the last quarter century, which is three times as good as the Dow.” If venture returns even half that, he continues, it will still outperform the public markets. Listen to this podcast to learn more about Rob’s background and what he has planned for Fission Ventures. And don’t forget to subscribe to Founders & Funders on iTunes, TuneIn, Stitcher, Google Play, iHeartRADIO, and Android.